I’ve been following the terrible crisis in Yemen for the last few years and had tried to understand the background, so I chimed in with a response that people appreciated. I decided to rework that answer and share it here, as follows. It sheds some light on how the country reached such a vulnerable point and became devastated by the current war. Geography plays an underappreciated role. 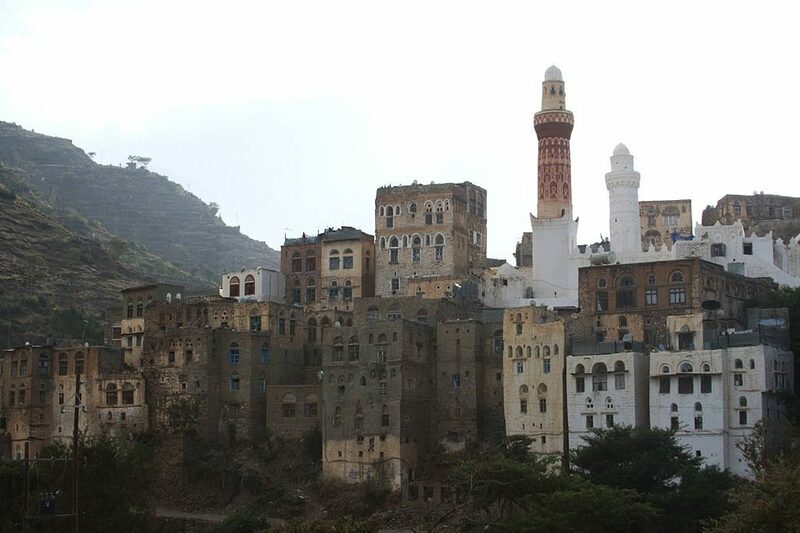 The Sarawat mountains run along Yemen’s western coast and many cities are located there, including the capital San’a. This kind of terrain makes governing difficult. Transportation and communication become more involved, particularly prior to the last few decades of technological developments in these areas. A more fractured society, both culturally and economically, is an inevitable result. The mountains, along with the climate (frequent droughts), also create challenging circumstances for agriculture. According to the World Bank, only 2.4 percent of Yemen’s land area can be farmed. While that’s a higher percentage than other Arab states, it’s still low. Plus, Yemen is with a much smaller land area than many other nations in the region. Furthermore, compared to other Gulf States, Yemen is not a rich source of oil. It has smaller oil fields that were discovered much later than other Gulf countries. Yemen does not belong to OPEC. Nevertheless, by necessity, agriculture and oil production make up a significant part of Yemen’s economy. It’s intrinsically hard for a country facing inherent problems with communication and transportation and where the leading industries are so constrained by a lack of natural resources to be economically prosperous. Especially when comparing Yemen to much larger states like Iran or Saudi Arabia, it’s such an uphill battle from the beginning. Like other Arab states, much of Yemen gained independence after the collapse of the Ottoman empire in 1918. The Mutawakkilite Kingdom of Yemen existed from 1918 to 1962. Still, to say they ruled over all of what you would consider modern Yemen would be an overstatement. First, the aforementioned geography made governing a difficult task for the burgeoning kingdom. But perhaps more notably, the British had maintained the Aden Protectorate, in the south of Yemen, since 1874. While the Ottomans had mostly accepted this arrangement, the Mutawakkilite Kingdom dreamed of uniting the territory. This desire led to decades-long fighting along and over the border between the two entities. Beyond the border skirmishes, the Mutawakkilite Kingdom also did what they could to support tribal revolts within the protectorate. The Mutawakkilite Kingdom faced its own share of in-fighting, too. The first imam was assassinated in a coup attempt in 1948, effectively deposing the regime until his son succeeded him as imam months later. There was another coup attempt in 1955, and then finally a successful one in 1962 after a power vacuum that followed the death of the second imam. All of these pressures made it difficult for Yemen to place the same emphasis on modernization that other Arab states exhibited during this time. After years of struggle to maintain control, the British finally departed for good in 1967. Yemen became divided into two countries. There existed what was effectively a military dictatorship (Yemen Arab Republic) in the north. It was bordered to the south by socialist satellite state of the Soviet Union (People’s Democratic Republic of Yemen). Both nations dealt with infighting (including civil wars in the South) as well as tension with one another. Neither state did well economically, due in large part to the challenges mentioned above. The two states eventually unified in 1990 to form the Republic of Yemen. Things might have turned around for Yemen economically here. The Iraqi invasion of Kuwait threw a wrench into things. Yemen opposed other (non-Arab) countries intervening, essentially allying itself with Iraq. Why did Yemen side with Iraq when almost no one else did? Publicly, Yemen’s ambassador justified this vote on the grounds that the resolution was worded so vaguely that the coalition could take military action beyond what had already been established needed to be done. They worried it could lead to a larger scale military confrontation. Yemen continued to advocate for a peaceful resolution instead. That position is undermined somewhat by the fact that Yemen had abstained (or was not present) for several previous resolutions condemning Iraq’s actions. Yemen and Iraq had close relations for some time. Yemen’s President, Ali Abdullah Saleh, was close with Iraqi President Saddam Hussein and admired him, to the point that Saleh’s opponents in Yemen used to refer to him derisively as “Little Saddam.” Aden, a major port in Yemen, was important to Iraqi shipping. Yemen had also given military aid to Iraq during their war with Iran. So Yemen tried to walk the awkward middle ground, recognizing the Iraqi invasion of Kuwait as illegal but abstaining from many of the harsher resolutions and voting against military intervention. As a result, the U.S. and Saudi Arabia withdrew aid, with the latter expelling Yemeni workers. The fallout had devastating economic consequences for Yemen just a short time after its unification. As we’ve seen from other divided countries who unified, integration is not a straightforward process. The Persian Gulf War created an economic crisis in the Gulf at a time when the newly unified Yemen could have used a lifeline. And by choosing Iraq, Yemen put itself on the losing side. It lost out on a lot of aid that could have helped. Then there are the wars. Wars are, in so many ways, economically expensive. It’s hard to produce oil and involve yourself in the world economy when your country is at war. The first Yemeni Civil War since unification happened in 1994 and the current one began in 2015. The intervening period was fraught with internal tension. Yemen hasn’t experienced extended periods of peace. Geographic considerations alone render it virtually impossible for Yemen’s economy to resemble Saudi Arabia’s or Iran’s. Combine those limitations with decades of division and war, and you have a struggling country that doesn’t have the resources, infrastructure, or peacetime needed to develop. Consider the unprecedented industrial and technological developments over full the time period described here. It’s a lot to miss out on. It’s no wonder Yemen couldn’t keep up economically even with smaller Gulf states.